The centre of our approach is to characterise the tumour tissue from UM patients with metastases, in order to define actionable therapeutic targets. The pharmaceutical industry mainly focuses on developing drugs which may work in as many tumour types as possible: this approach only rarely results in drugs that work in rare tumours, such as UM. While our major objective is to identify new potential therapeutic strategies for metastatic UM, the centre of our approach is to characterise the tumour tissue from UM patients with metastases, in order to define actionable targets. 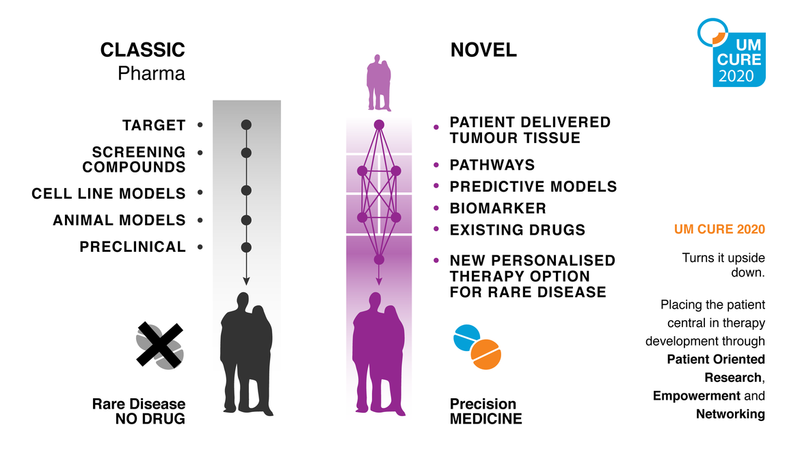 We will develop tumour-specific preclinical models and biomarkers to evaluate single drugs or their combinations. The most promising drugs will then be tested in clinical trials, outside the frame of the project. In addition, we aim at connecting directly with UM patients throughout Europe, providing them with up-to-date information on new treatments for their disease and possibilities to get involved. Patients are therefore central in each of our research steps up until the dissemination and implementation of the results.